Our adjustable pressure monitor can send instant e-mail or text alerts to qualified personnel before production loss. Using an adjustable pressure switch paired with the Nanospark Machine Monitor, when pressure changes state the switch sends a signal to Nanospark. Nanospark then relays the message via WiFi connection to the preferred contact – by text or e-mail. 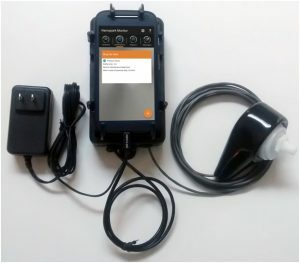 The Nanospark Adjustable Pressure Monitor comes with the Nanospark Machine Monitor hardware and software, adjustable pressure switch, and 120V power. Please note a WiFi network must be available in the facility. 1. Find Location – Make sure WiFi is available and 120V power is nearby. 2. Connect the pressure switch to the airline. The pressure switch is a 1/8″ NPT, therefore pipe fitting may be necessary. 3. Provide power to the Nanospark hardware. 4. After you see the “Board Connected” message, Open the Machine Monitor app from the main screen of the tablet. 5. Configure the contact, event and notifications within the Machine Monitor app. For more information about the monitoring air pressure via text or e-mail, visit the product page.